The revolution led by Fidel Castro that took place in 1961 shifted the country democratically, politically and educationally, significantly targeting the problem of its insufficient and almost non-existent education system. Yet today it is known as the one of the world’s most successful literacy campaign. So what happened to create such a major shift? 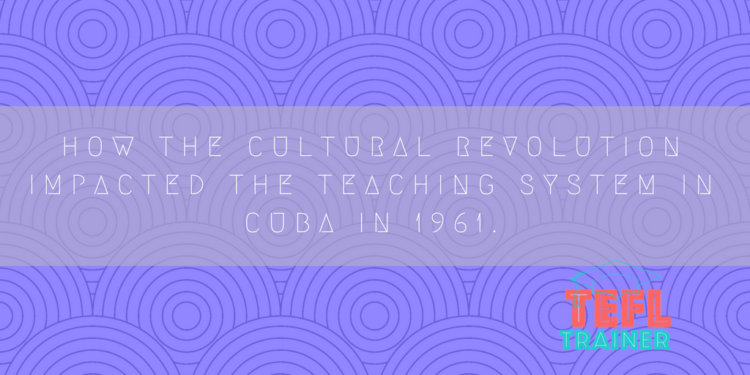 Before 1959 the literacy rate in Cuba was as low as 60% due to the lack of education in rural areas and a limited source of teachers, the majority of average citizens could neither read nor write. The difficulty of being illiterate impedes the basic social functions and day to day needs, such as getting a job, using transport, reading signs and directions. Where would we be as an illiterate society? It is difficult to imagine a life without teachers. Cuba was battling with a maximum of 22,000 before 1961. Today it has increased to an impressive 258,126, rising each year. An aspect that I find extremely significant is the revolutionaries and intellectuals such as Carlos Puebla, who inspired the country through song. The main theme highlighted the spiritual importance of education, Puebla sang ‘aprender a leer es aprender a vivir´ meaning ´to learn to read is to learn to live´ and ´se culto para ser libre´ ‘to be cultured is to be free’. The campaign not only brought intellectuals to light but it created writers. People could finally express themselves using poetry, memoirs and testimonials. Cuba’s transformation highlights that literacy brings about mobilisation and personal investment for the collective good, not only in Cuban citizens but as an example of a human right. I would like to add that literacy enables access not only for professional development, but also intellectual and spiritual development. Today the literacy rate overall averages at 99.7% demonstrating the eradication of illiteracy developed the country to reaching its high standards today. One could argue that perhaps why Latin American culture holds a polychromic learning style in order to meet the high standards of other teaching cultures. For me this is one of the most powerful examples of the importance of education and teaching.